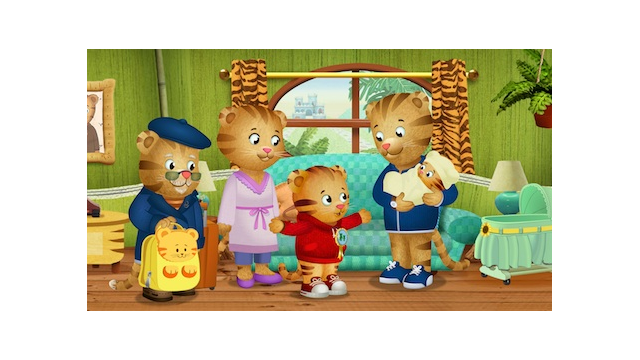 Arlington, VA and Pittsburgh, PA, June 26, 2014 – DANIEL TIGER’S NEIGHBORHOOD, a top-rated PBS KIDS animated television series from The Fred Rogers Company, has been winning the hearts of little “tigers” and their families nationwide since its premiere – and soon there will be even more to love! Season 2 of the popular series kicks off on Monday, August 18, on PBS KIDS (check local listings) with a special one-hour premiere celebrating the arrival of a new addition to the Tiger Family: Daniel Tiger’s little sister Margaret. After the upcoming “Meet the New Baby” special, PBS KIDS will premiere two more new episodes on Tuesday, August 19, and Wednesday, August 20, focusing on Daniel and his family as they adjust to life with the baby. New digital content, including two online games and an app, will also launch in August. “We’re delighted to present the second season of DANIEL TIGER’S NEIGHBORHOOD on PBS KIDS and to introduce a wide range of topical themes, including smoothing the transition for preschoolers with a new sibling,” said Paul Siefken, Vice President, Broadcast and Digital Media, The Fred Rogers Company, producer of the series. “One of Fred Rogers’ key goals was to address the issues that affect families most, and we look forward to continuing to help preschoolers learn and grow with these adorable new episodes,” added Angela C. Santomero, Series Creator and Co-Executive Producer. With the “Meet the New Baby” special and the episodes that follow, DANIEL TIGER’S NEIGHBORHOOD shines a spotlight on a relevant topic for families and preschoolers everywhere. Inspired by the enduring wisdom of Fred Rogers, the shows tackle many of the important issues young children encounter with a new sibling – such as feeling left out, learning to share time and attention, and appreciating how fun a little sister (or brother) can be – with accompanying strategies that help preschoolers work through their feelings. “Meet the New Baby” debuts on PBS stations nationwide and on the PBS KIDS Video Player, the PBS KIDS Video App, Apple TV and PBS KIDS’ Roku channel on Monday, August 18. Season 2 of DANIEL TIGER’S NEIGHBORHOOD, the first original TV series from The Fred Rogers Company since MISTER ROGERS’ NEIGHBORHOOD, features 25 new episodes with a host of charming stories and catchy musical strategies that have become the show’s signature and helped it earn high marks among parents and preschoolers alike. DANIEL TIGER’S NEIGHBORHOOD was created by some of today’s pre-eminent innovators of quality children’s media. Angela C. Santomero of Out of the Blue Enterprises provided the creative vision for the new series. Santomero, Kevin Morrison of The Fred Rogers Company, and Vince Commisso of 9 Story Entertainment are the program’s executive producers. Each episode showcases two engaging stories starring four-year-old Daniel Tiger and his best friends, who invite viewers to come with them on fun adventures as they explore the colorful Neighborhood of Make-Believe. The innovative use of irresistible musical strategies reinforces the unique theme of every show, so that preschoolers and parents will want to sing along and incorporate them into their daily lives. Images, episode descriptions and other materials from DANIEL TIGER’S NEIGHBORHOOD are available on PBS PressRoom. For more DANIEL TIGER’S NEIGHBORHOOD adventures, visit pbskids.org/daniel and follow the series on Twitter and Facebook. The company was founded by Fred Rogers in 1971 as the non-profit producer of MISTER ROGERS’ NEIGHBORHOOD for PBS. In the years that followed, it not only created hundreds of episodes of this much-loved program, but also extended Fred’s values and approach to other efforts in promoting children’s social, emotional and behavioral health and supporting parents, caregivers, teachers and other professionals in their work with children. The Fred Rogers Company continues to build on Fred’s legacy in innovative ways through a wide variety of media, and engaging new generations of children and families with his timeless wisdom. The company’s highly-rated children’s TV series include DANIEL TIGER’S NEIGHBORHOOD and PEG + CAT. For more information, visit www.fredrogers.org. *Source: Nielsen NPower, 3/31/2014 - 4/27/2014, Live+7 Days national GAA ratings for PBS and select competitive cable networks (Cartoon Network, Disney Channel, Disney Jr., The Hub, Nickelodeon, Nick Jr., Nick Toons, Disney XD, and Sprout). Telecasts are accumulated across the entire week based on unique program names only, with four or more telecasts per month required for inclusion in this report. Ranker excludes specials, movies and programs with a duration under 15 minutes per telecast. **Source: Google Analytics, January – May 2014.